Alta E. Harding was born on 19 April 1884 at Shelby Co., IN. She was the daughter of James Harding and Nancy Jane Porter. Alta E. Harding married LeRoy VanArsdale on 29 April 1903 at Shelby Co., IN. Alta E. Harding died on 9 October 1948 at Shelbyville, Shelby Co., IN, at age 64. Eliza J. Cambridge was born in 1837. She married George McKinney on 9 May 1861 at Marion Co., IN. Eliza J. Cambridge died in 1870. Margaret Eldora VanArsdale was born on 24 January 1918 at Connersville, IN. She was the daughter of LeRoy VanArsdale and Alta E. Harding. Margaret Eldora VanArsdale died on 24 April 1989 at W. S. Major Hospital, Shelbyville, Shelby Co., IN, at age 71. Nancy Jane Porter was born on 14 January 1842 at Shelby Co., IN. She married James Harding. Nancy Jane Porter died on 21 December 1917 at Johnson Co., IN, at age 75. Jennie Day was born on 2 October 1846 or 1850 at Ireland. She married Thomas Skelly McDowell on 19 July 1865 at Dunkirk, Chautauqua Co., NY. Jennie Day died before 1 January 1920. Mary Nagel was born in May 1860 at Austria. She married John Peter Marcus in 1879. Mattie Corrine Bromley was born on 8 February 1905 at Flatwoods, northern Wayne Co., TN. She was the daughter of Thomas Carroll Bromley and Mary Chappell. Mattie Corrine Bromley married Jasper Newton Brewer on 9 November 1926 at Wayne Co., TN. Mattie Corrine Bromley died on 9 September 1999 at Waynesboro, Wayne Co., TN, at age 94. Carolyn Lorainne Brewer was born on 28 October 1946 at Wayne Co., TN. She was the daughter of Jasper Newton Brewer and Mattie Corrine Bromley. Carolyn Lorainne Brewer died on 21 February 1949 at Wayne Co., TN, at age 2. Lois Louise Baxter was born on 8 May 1807 at Elizabethtown, Leeds, Ontario, Canada. She married Benjamin F. Austin, son of Benjamin F. Austin and Jerushia Mather, on 8 November 1825 at Lockport, NY. Lois Louise Baxter died on 5 September 1895 at Independence, Jackson Co., MO, at age 88. Mary Barnum Drew was born on 6 June 1833 at CT. She married George B. Austin, son of Benjamin F. Austin and Lois Louise Baxter. Florence Mary Grant was born on 4 March 1864 at Chelsea, Suffolk Co., MA. She married George Ambler Thompson, son of Sidney John Thompson and Emily Jane Cowdrey, on 11 May 1884 at Chelsea, Suffolk Co., MA. Florence Mary Grant died on 1 November 1957 at Saugus, Essex Co., MA, at age 93. Nettie Mae Hayes, daughter of Drayton and Sarah hayes, was born March 22, 1880 on a farm near Littles, Iowa, and departed this life on Monday, Dec. 17, 1934 at the age of 54 years, 8 months and 25 days. She grew to young womanhood and received her education in that community. When a child she united with the Methodist church at Littleton, and remained a faithful member through her entire life. On September 8, 1898, she was united in marriage to Oden J. Kissinger and they began their happy wedded life on a farm near her home, later coming to this community. To this union were born ten children, all growing to young manhood and womanhood with the exception of Letha Leone, who passed away at the age of four years. Those who are left to mourn her passing are the kind and loving husband, and three children: Orin H. of Reading, Penn; Oma Kelly, of Craig, Mo; Clifford of Delphos; Mabel Smejkal of Glasco; Floy Gaddis, Bellflower, Calif; Don of Reading, Penn; James, Dean and Esther and Grandfather Kissinger of the home. Besides these there are two sisters, Mattie and Beulah of Littleton, Iowa; one brother, Harvey of Waterloo, Iowa; one brother Everett of St. Croix, Wis; and ten grandchildren. She was a kind and loving wife and mother, and was ever doing kind things for her children. Her many friends were numbered by her acquaintances, who today mourn her sudden passing. [S807] Find A Grave, online http://www.findagrave.com, Find A Grave, database and images (https://www.findagrave.com : accessed 01 June 2018), memorial page for Nettie Mae Hayes Kissinger (22 Mar 1880–17 Dec 1934), Find A Grave Memorial no. 85967472, citing Glasco Cemetery, Glasco, Cloud County, Kansas, USA ; Maintained by Cheryl White (contributor 47328595) . [S336] Ancestry.com, Ancestry.com. Tennessee, Deaths and Burials Index, 1874-1955 [database on-line]. Provo, UT, USA: Ancestry.com Operations, Inc., 2011. "Tennessee Deaths and Burials, 1874–1955." Index. FamilySearch, Salt Lake City, Utah, 2009, 2010. Index entries derived from digital copies of original and compiled records. 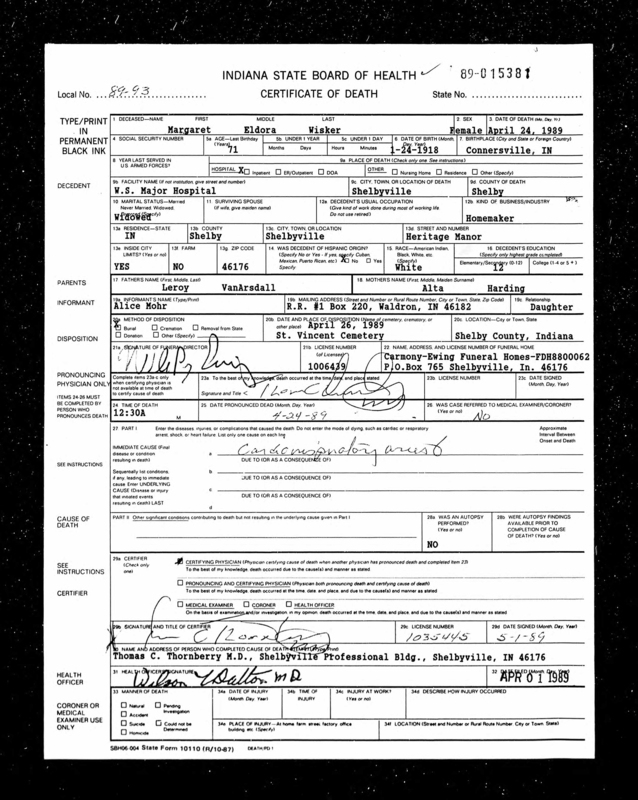 Tennessee State Library and Archives; Nashville, Tennessee; Tennessee Death Records, 1908-1959; Roll #: M-14. [S311] Unknown compiler, "Tennessee Deaths and Burials, 1874-1955," database, FamilySearch (https://familysearch.org/ark:/61903/1:1:F65V-M21 : 10 February 2018), Nancy Regina Turk Wolfe, 11 Sep 1910; citing Nashville, Davidson, Tennessee, reference yr 1879 cn v 8 rn 1462; FHL microfilm 1,276,595. Margaret (?) was born in 1827. She married Joseph Wolfe. Nevelyn Kyle Stanley was born in 1906. She died in 1981. Michael Taintor was born on 31 December 1719.1 He married Sarah Loomis, daughter of Nathaniel Loomis and Sarah Skinner, in 1745.1 Michael Taintor died in 1748. Polina Roblee was born on 15 March 1795. She married William Case, son of Abraham Case and Ruth Preston, on 18 January 1814. Polina Roblee died on 5 June 1851 at age 56. Franklin C. Alsup was born in 1823 at TN. He married Nancy E. Singleton on 8 January 1851 at Pontotoc, MS. Franklin C. Alsup died circa 1865. Laura A. Hewings was born on 26 April 1826. She married Richmond Edwin Case, son of William Case and Polina Roblee, on 8 October 1848 or 8 October 1849 at St. Joseph Co., MI. Laura A. Hewings died in 1895. [S807] Find A Grave, online http://www.findagrave.com, Find A Grave, database and images (https://www.findagrave.com : accessed 12 February 2018), memorial page for John Hopkins Lee (12 Nov 1799–12 Sep 1858), Find A Grave Memorial no. 30201194, citing South Belton Cemetery, Belton, Bell County, Texas, USA ; Maintained by SFC Frank Irons Sr. Retired US Army 1977 (contributor 46510193) . Minnie Frances Houk was born on 14 November 1865. She married Franklin Blain Case, son of Richmond Edwin Case and Laura A. Hewings, on 22 April 1886 at Frankfort, Benzie Co., MI. Minnie Frances Houk died on 31 August 1958 at age 92. Morgan Holcombe was born on 1 January 1837 at Sterling, Cayuga Co., NY. He was the son of George W. Holcombe and Lucinda Phillips. Morgan Holcombe died after 1910 at Cleveland, Klickitat Co., WA. Frances Case was born on 2 August 1887 at Three Rivers, St. Joseph Co., MI. She was the daughter of Franklin Blain Case and Minnie Frances Houk. Frances Case died on 15 September 1956 at Norwalk, Los Angeles Co., CA, at age 69. Woody Burch Taylor was born in January 1770 at SC. He married Nancy Seay. Woody Burch Taylor died in 1840 at Lincoln Co., TN. 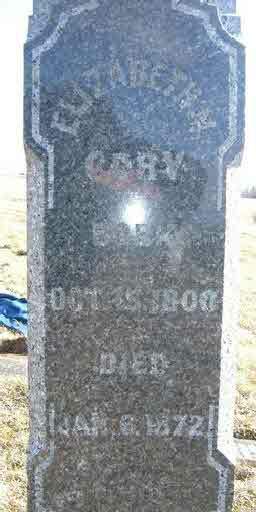 [S807] Find A Grave, online http://www.findagrave.com, Find A Grave, database and images (https://www.findagrave.com : accessed 28 June 2018), memorial page for George Holton Corey (7 Dec 1892–11 Nov 1958), Find A Grave Memorial no. 168045548, citing Mount Hebron Cemetery, Upper Montclair, Essex County, New Jersey, USA ; Maintained by Jody Lutter (contributor 46598882) . Newton David Moore was born on 8 May 1806 at Brush Creek, Adams Co., OH. He was the son of Hosea Moore and Isabella Hannah Burkett. Newton David Moore married Rebecca Burkitt on 16 September 1827 at Adams Co., OH. Newton David Moore died on 16 September 1890 at Jefferson, Adams Co., OH, at age 84. [S418] Ruth Cost Duncan, John Case 2nd Edition, page 11. Thomas Newton Moore was born in 1843 at Adams Co., OH. He was the son of Newton David Moore and Rebecca Burkitt. Thomas Newton Moore died in 1930 at Brush Creek, Adams Co., OH.